A Green Burial is a form of disposition which allows the deceased individual to recycle back to the earth without chemical preservation, metal caskets, chemically treated wood caskets, and or outer burial vaults. The body is prepared with natural or organic products, and only natural cosmetics are applied. The family is also able to join in the ritual washing of the deceased. A burial shroud, a long piece of cloth usually constructed of 100% cotton or linen, surrounds the deceased. The body can then be placed in a casket constructed of biodegradable materials including wood, bamboo, or willow, excluding metal parts and fasteners. The family may help lower the deceased into the ground at the cemetery, and they are also encouraged to be involved with services. Can I arrange a Green Burial at a Bradley Funeral Home? Yes, Bradley & Son Funeral Homes are certified by the Green Burial Council. Please speak with one of our caring funeral professionals who will be happy to help you with your request. Each family has the opportunity to have visitation at the funeral home, at their place of worship, deceased’s home, or the graveside. The deceased will be shrouded and placed in a green casket or temporary biodegradable alternate container during calling hours or funeral service. Any type of service may be rendered by clergy, family/friends, or our in-house celebrants, Austin Bremner and Jack Cuffari. Every aspect of a Celebrant Service celebrates your loved one’s lifestyle, using a more personalized and humanistic touch. 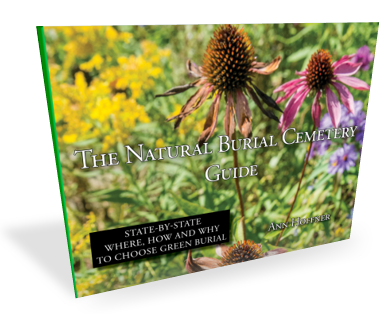 Bradley & Son Funeral Homes is proud to be featured in the latest edition of The Natural Burial Cemetery Guide.